Archeologist; born at Cheltenham 1843; died in London July 14, 1900. 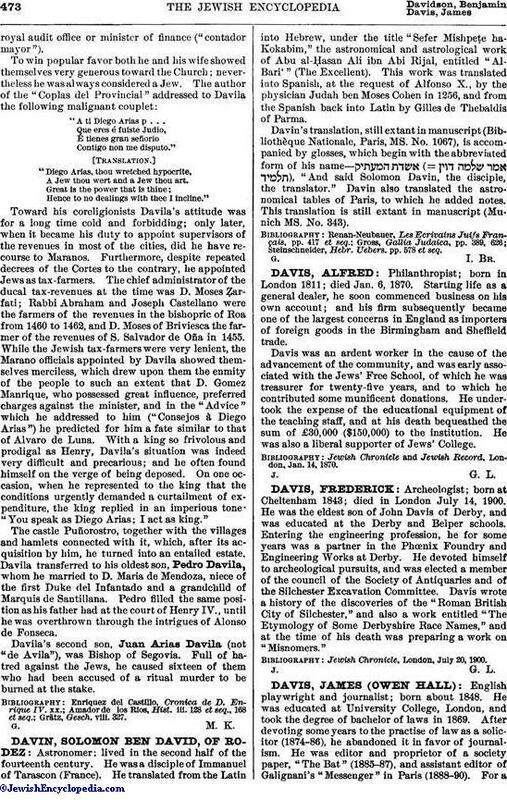 He was the eldest son of John Davis of Derby, and was educated at the Derby and Belper schools. Entering the engineering profession, he for some years was a partner in the Phœnix Foundry and Engineering Works at Derby. He devoted himself to archeological pursuits, and was elected a member of the council of the Society of Antiquaries and of the Silechester Excavation Committee. Davis wrote a history of the discoveries of the "Roman British City of Silchester," and also a work entitled "The Etymology of Some Derbyshire Race Names," and at the time of his death was preparing a work on "Misnomers." Jewesh Chronicle, London, July 20, 1900.